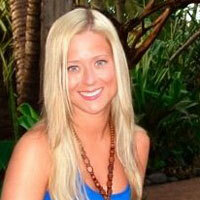 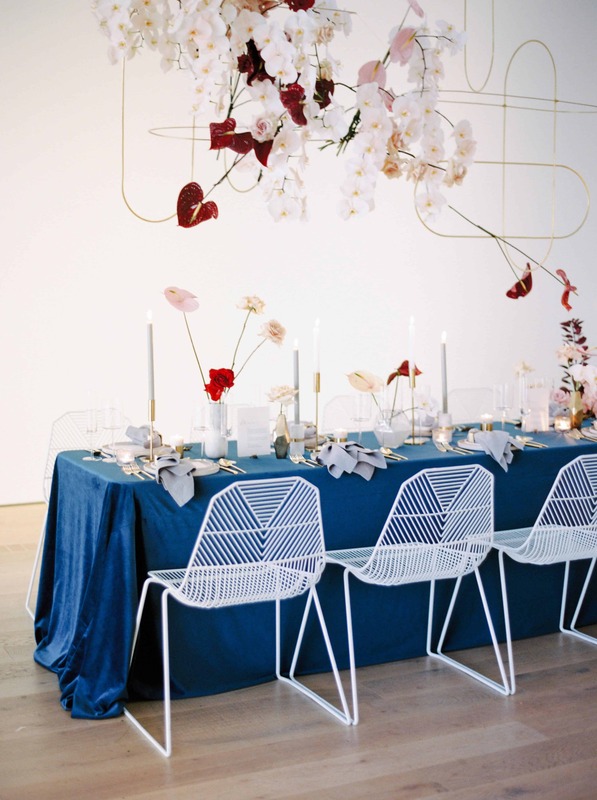 “We wanted this design to communicate that what we create is art,” says Jessica Minnie of Petite Pearl Events. 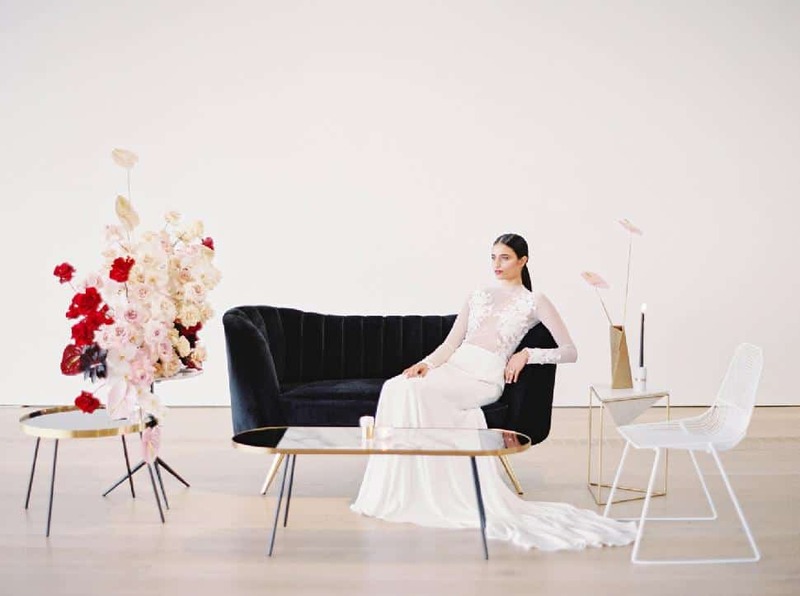 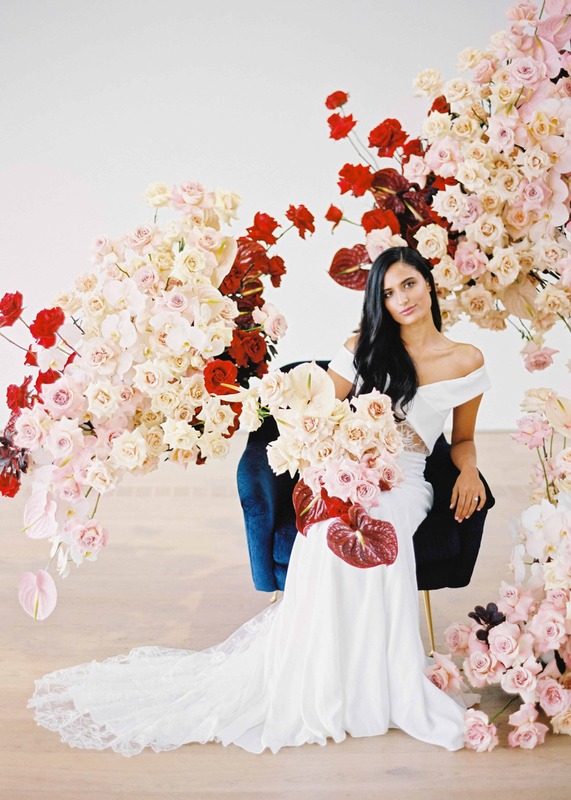 “Something that is not just beautiful, but interesting, meaningful and could be interpreted in different ways… and The Polygon Gallery provided the perfect space to display it.” Celsia Florist created the dramatic floral installations, which act as structural art pieces. 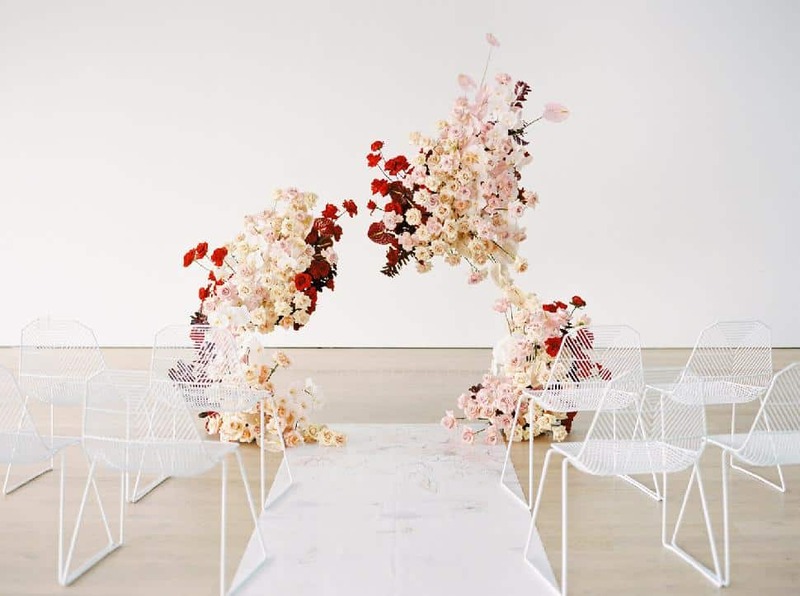 The high-impact ceremony arch plays with balance, asymmetry and tension to anchor the space. 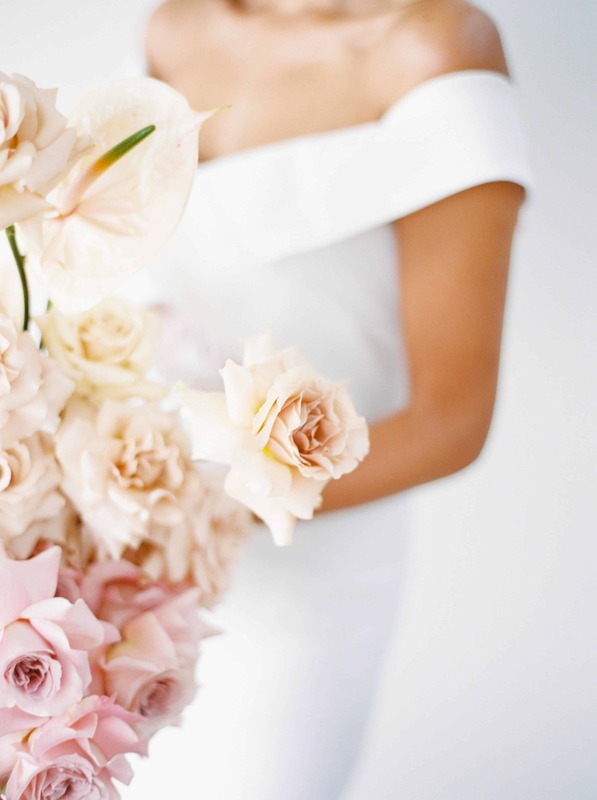 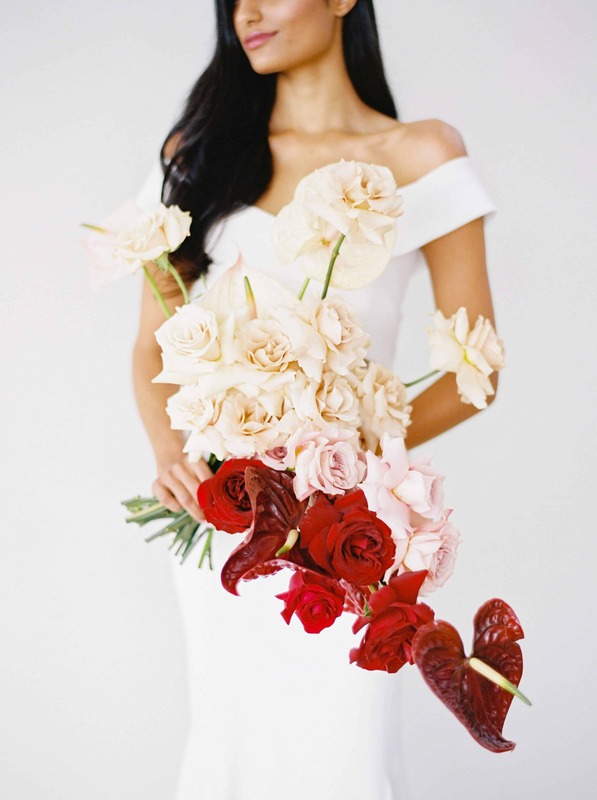 The bridal bouquet has a contemporary shape and features the same colours as the other floral arrangements to create cohesion in the design. 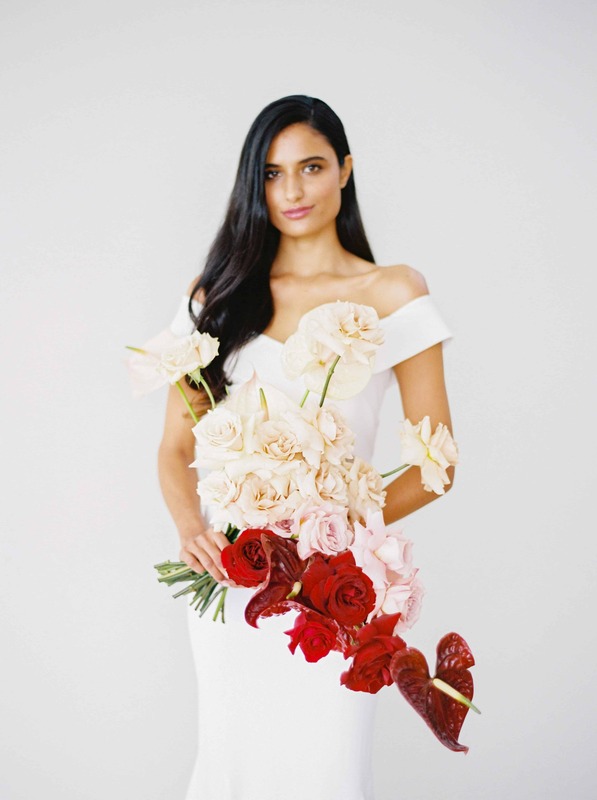 The off-the-shoulder Rime Arodaky “Coppelia” crepe dress from Union Bridal with its floral tulle cut-out in the bodice mimics the illustrations on the stationery and adds a playful edge. 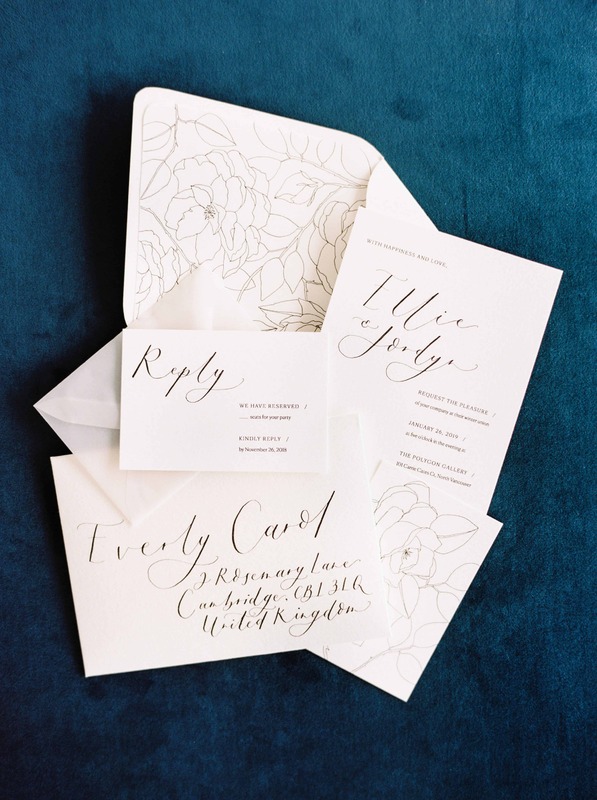 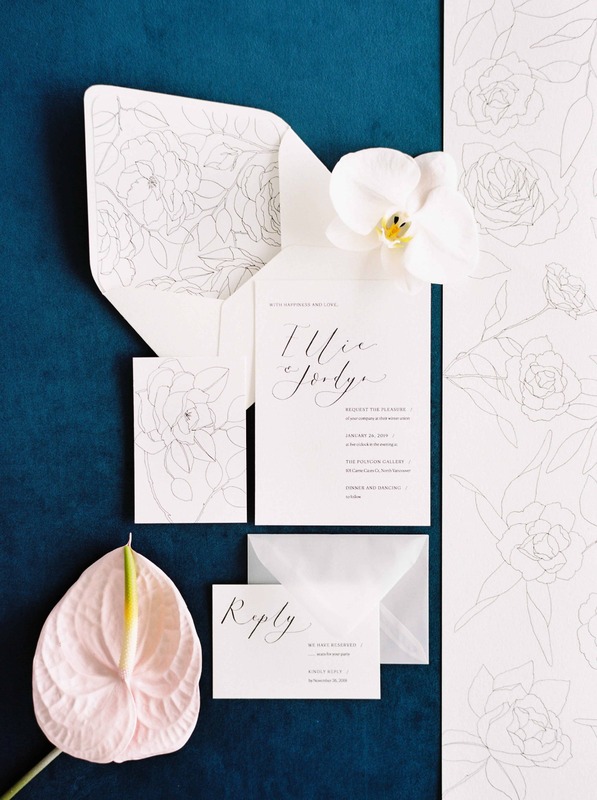 The black-and-white ﬂoral-illustrated stationery from Oh The Sweet Things was inspired by the Primrose Wall Mural from Urban Walls that was used as both the aisle runner and as the backdrop for the bar area. 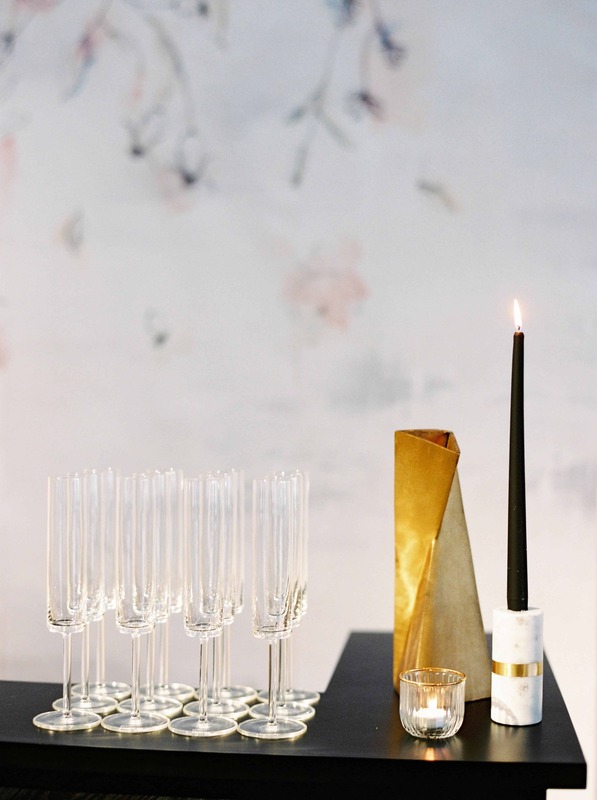 The clean line drawings help to maintain a dainty look throughout the design, while also feeling modern and minimalist. 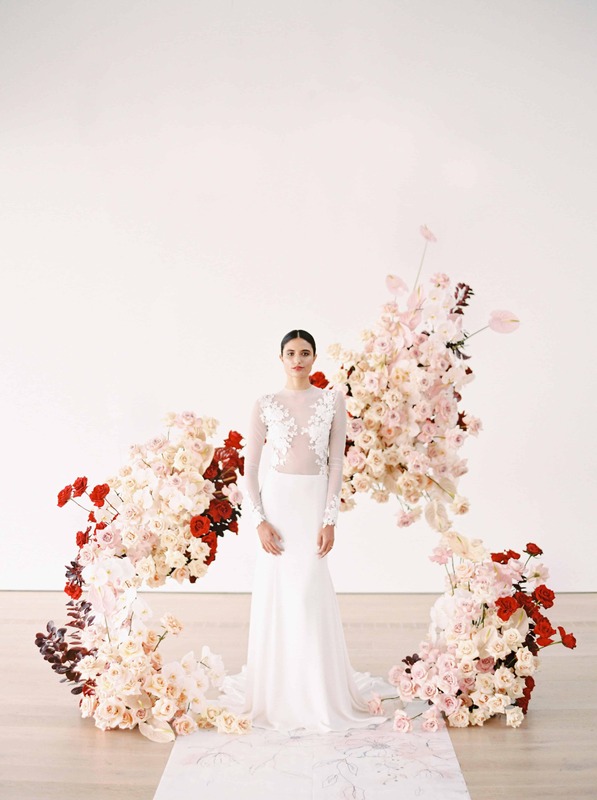 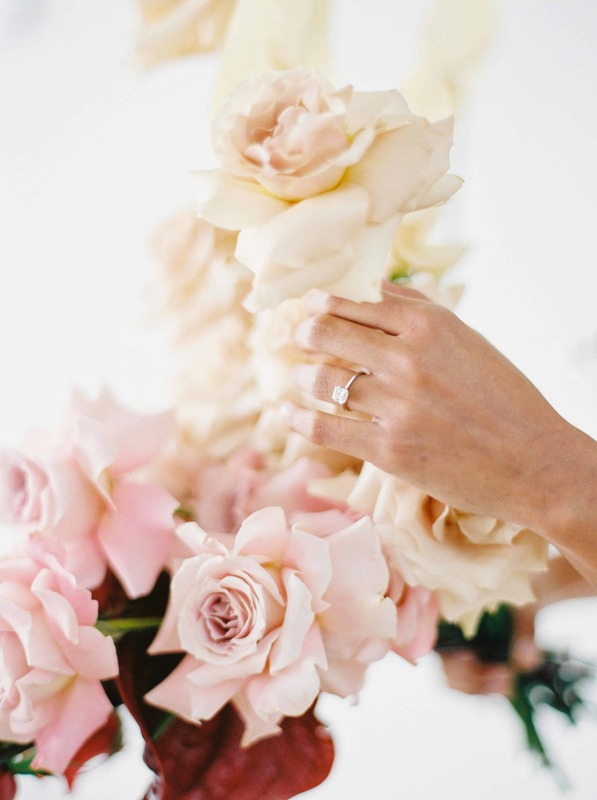 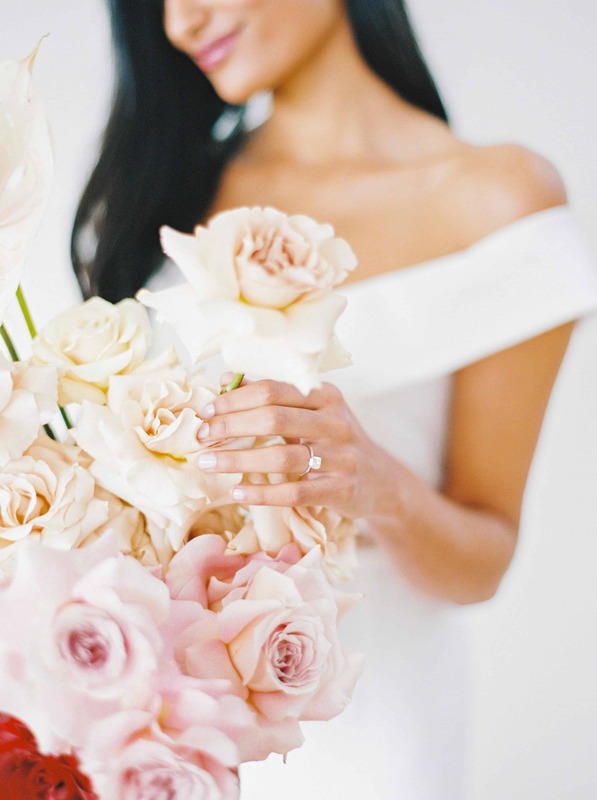 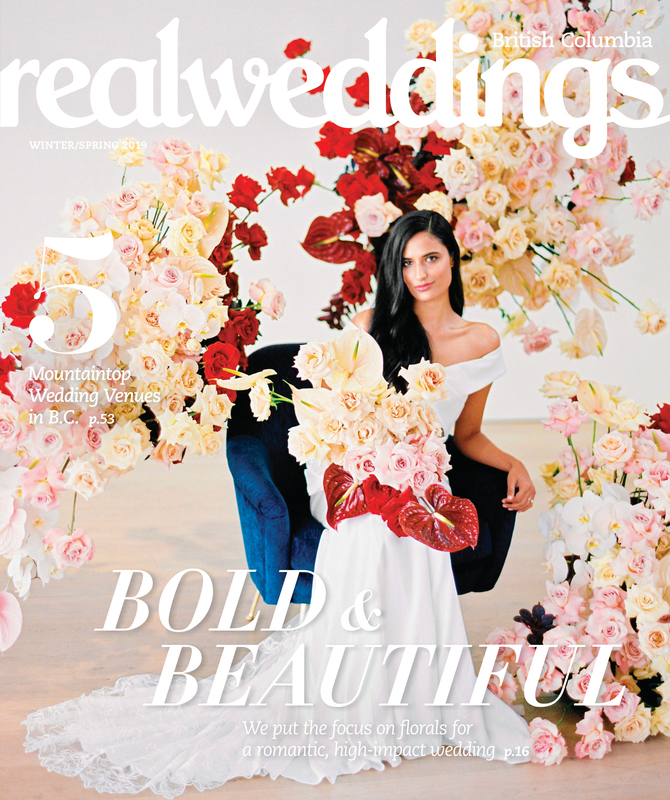 The three-dimensional suspended floral pieces for the ceremony were inspired by the traditional crescent shape often used around the altar to add intimacy. 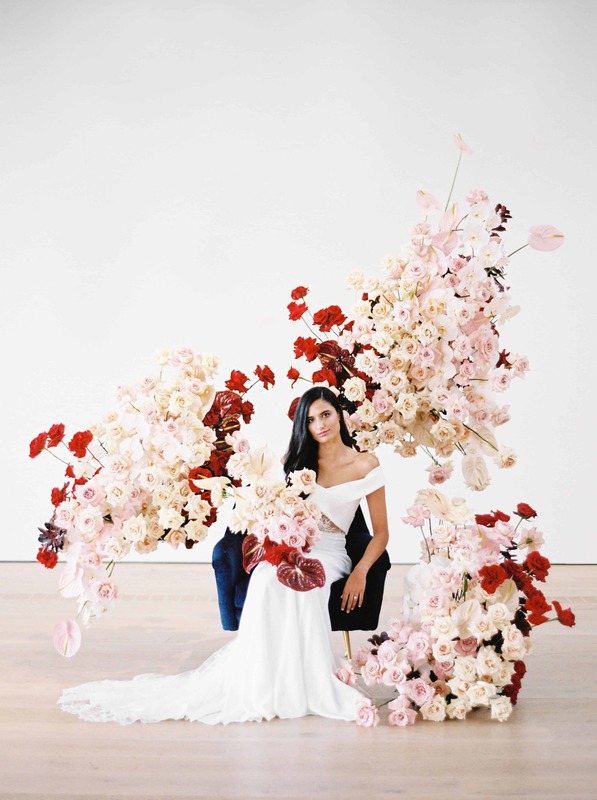 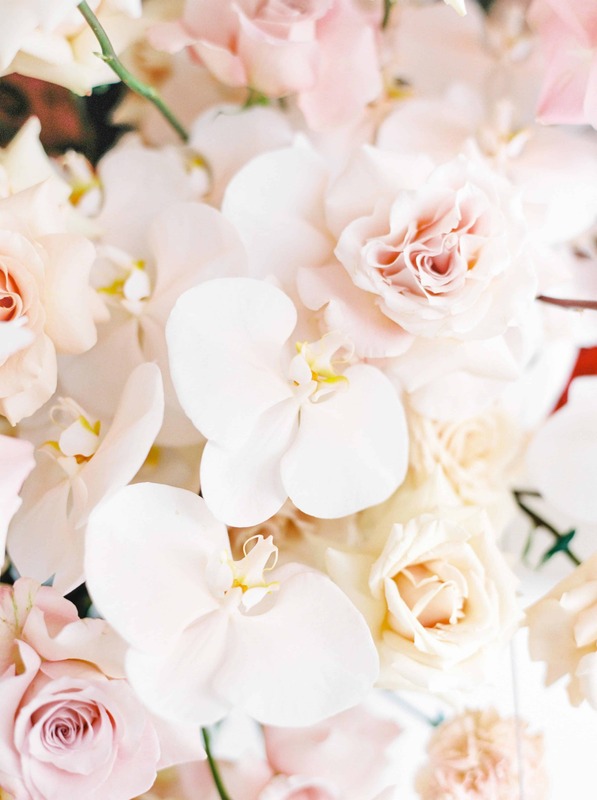 The absence of foliage creates a dramatic effect, allowing the orchids, anthuriums and roses to stand out. 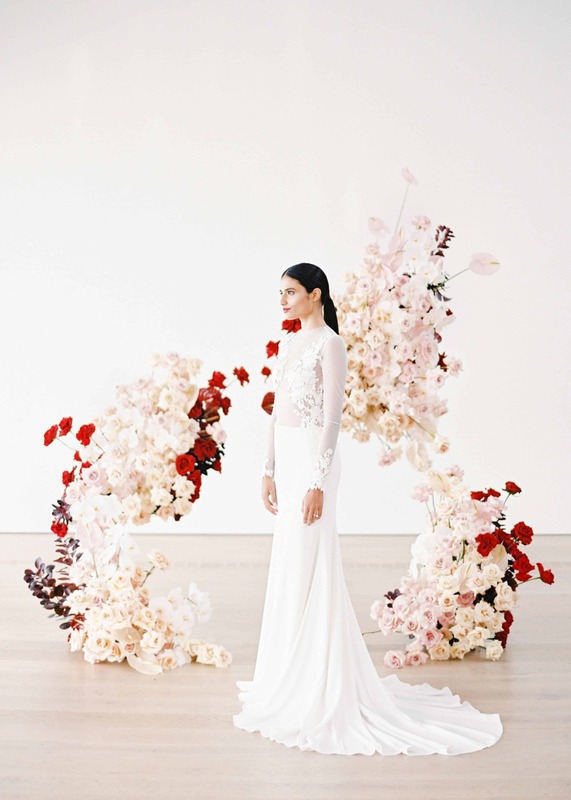 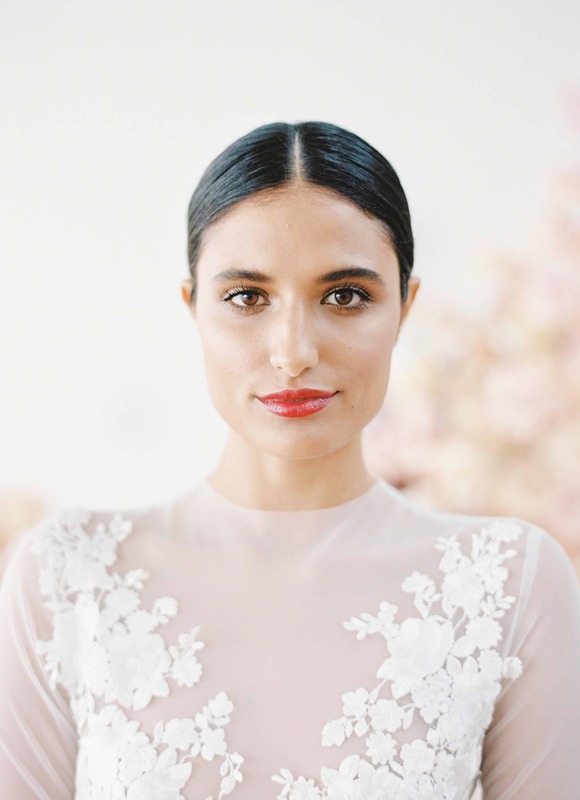 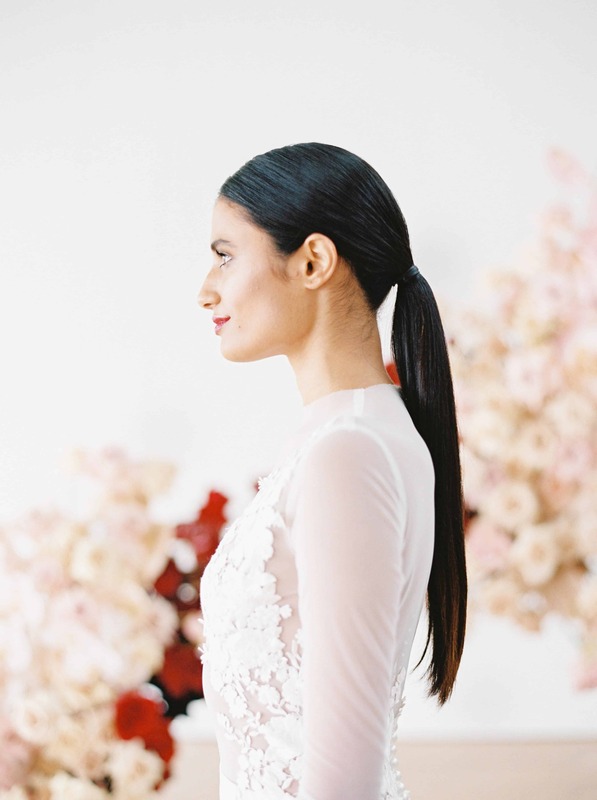 The Daalarna gown with ﬂoral appliqué from Union Bridal represents a more fashion-forward version of the classic long-sleeve wedding dress. 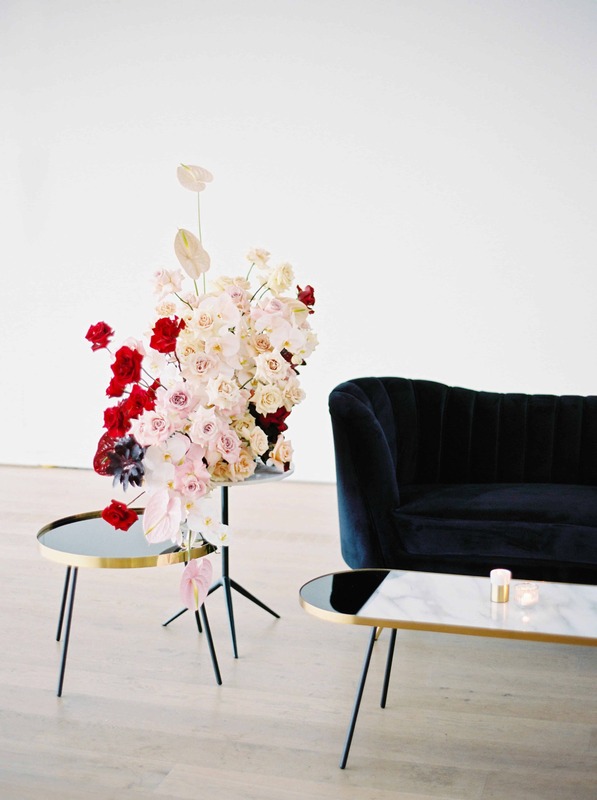 The furniture in the lounge and bar area works together to create visual interest in shape, form and detail. 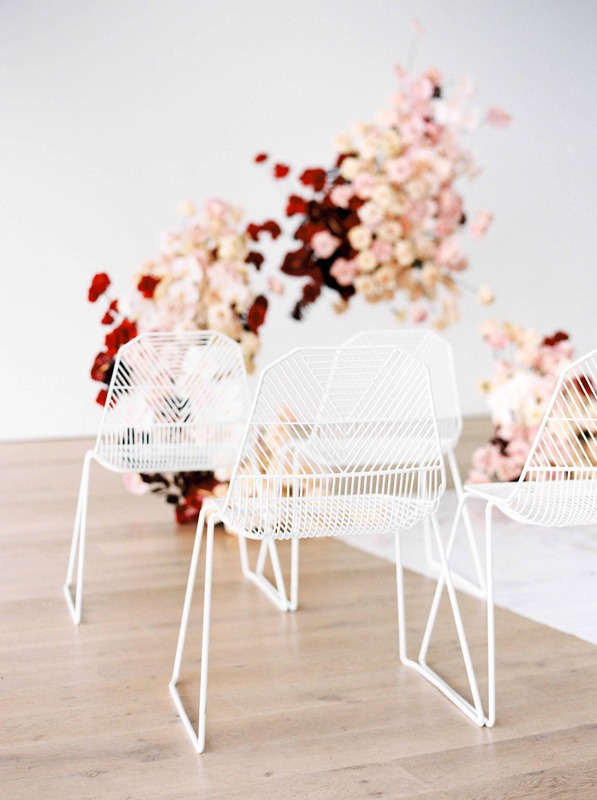 The geometric chairs and bar stools from The Wise Co. add a touch of maturity and help balance out all the pinks and florals, preventing the space from becoming overly feminine. 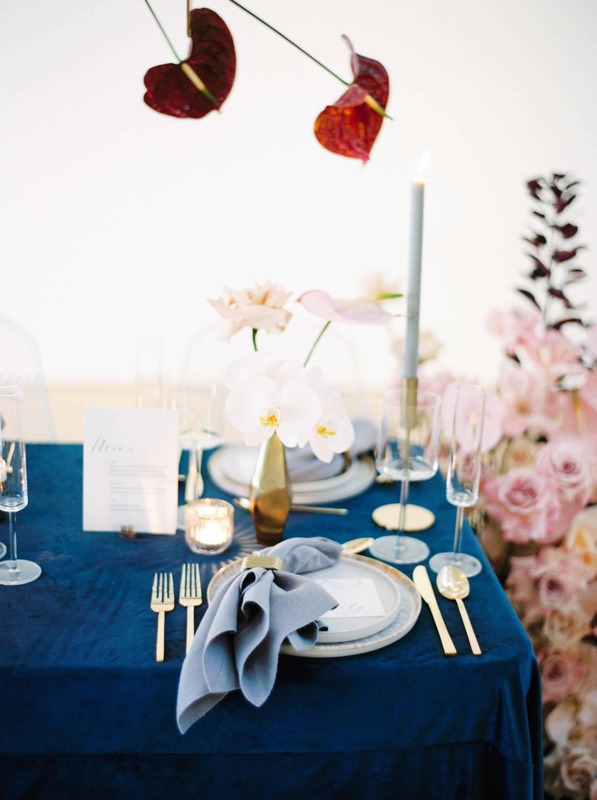 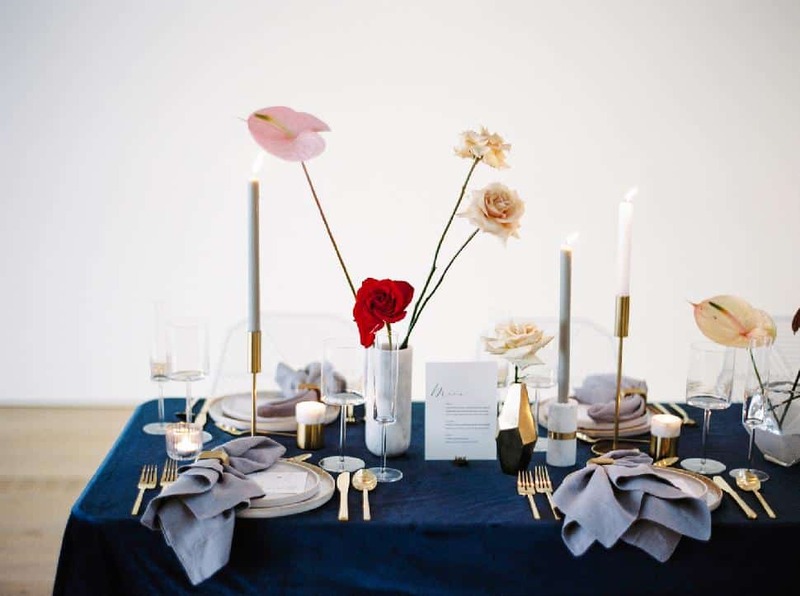 For the tablescape, a navy velvet tablecloth and grey napkins from La Tavola Fine Linen help neutralize the “girly-ness” of the pink, red and white colour palette and elevate the overall design to a more mature feminine look. 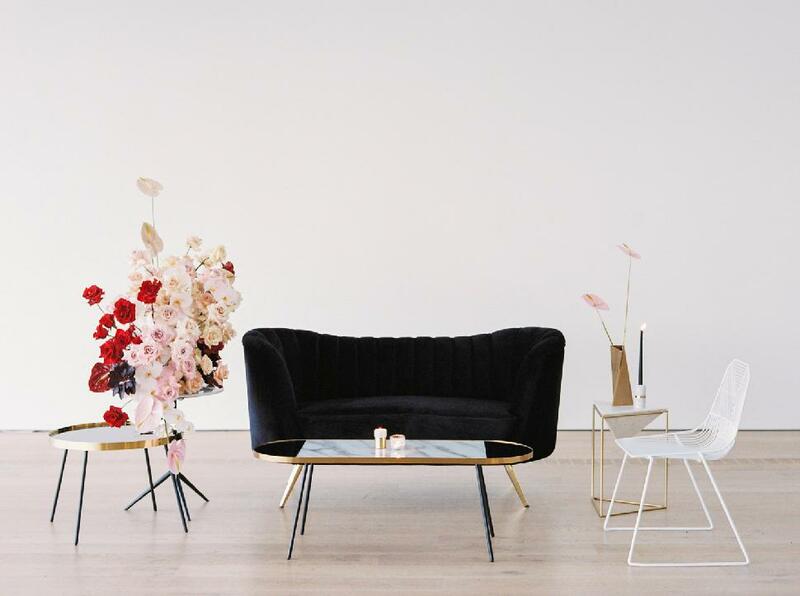 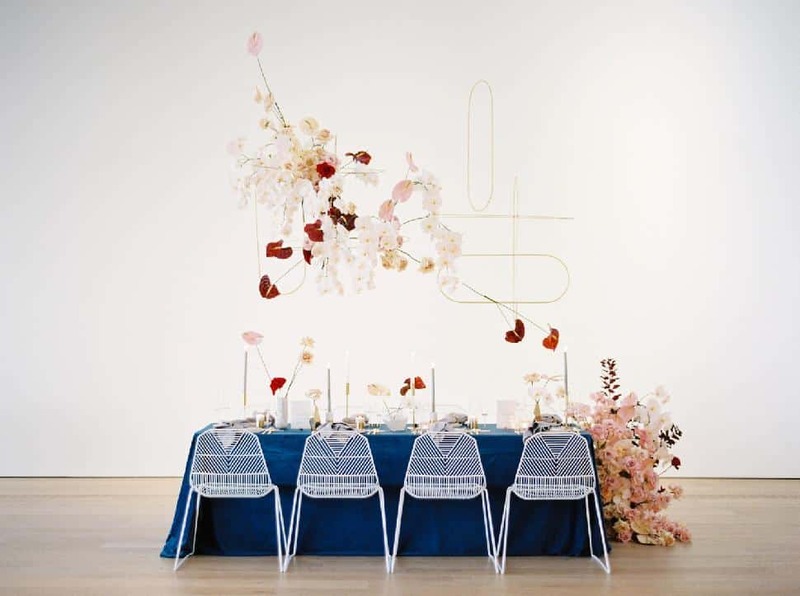 The hanging floral installation makes a dramatic impact and allows space on the table for more curated, minimalist elements. 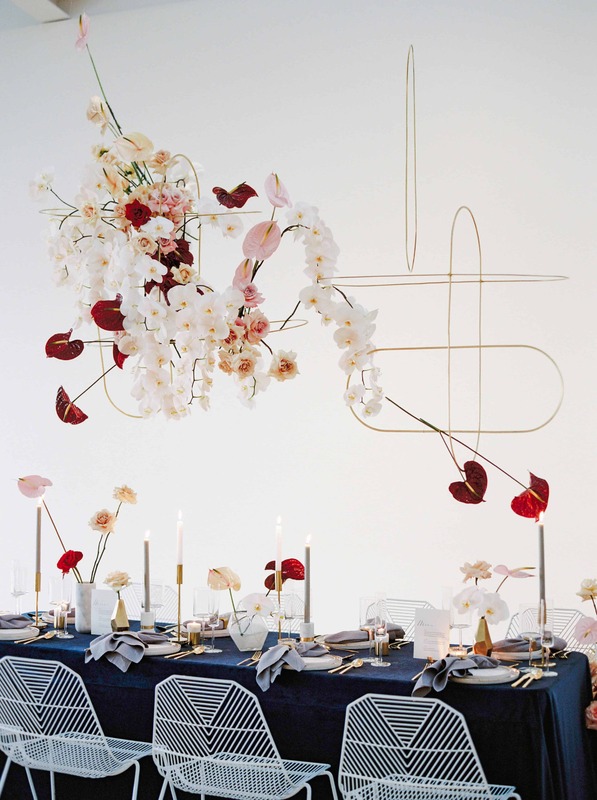 With such an elaborate floral installation hanging over the table, the arrangements on the table are intentionally simple. 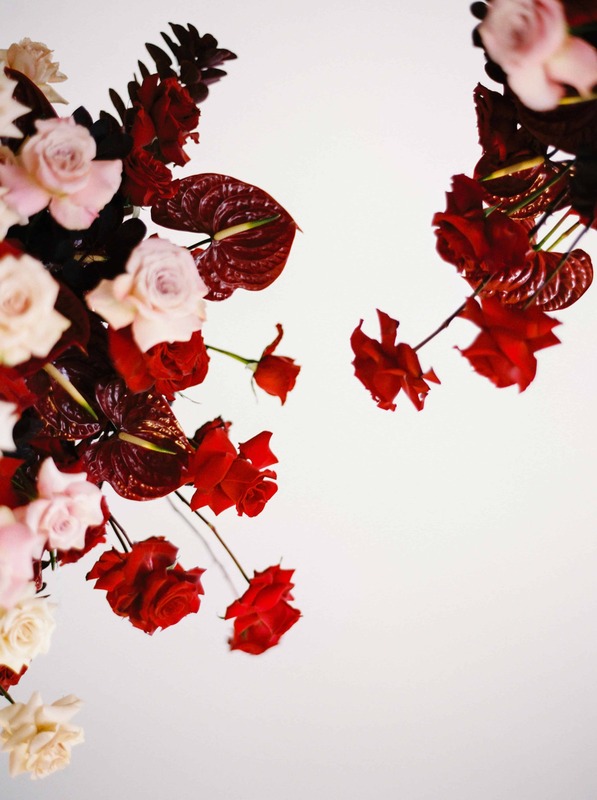 Each was designed with ikebana, the Japanese art of flower arranging, in mind. 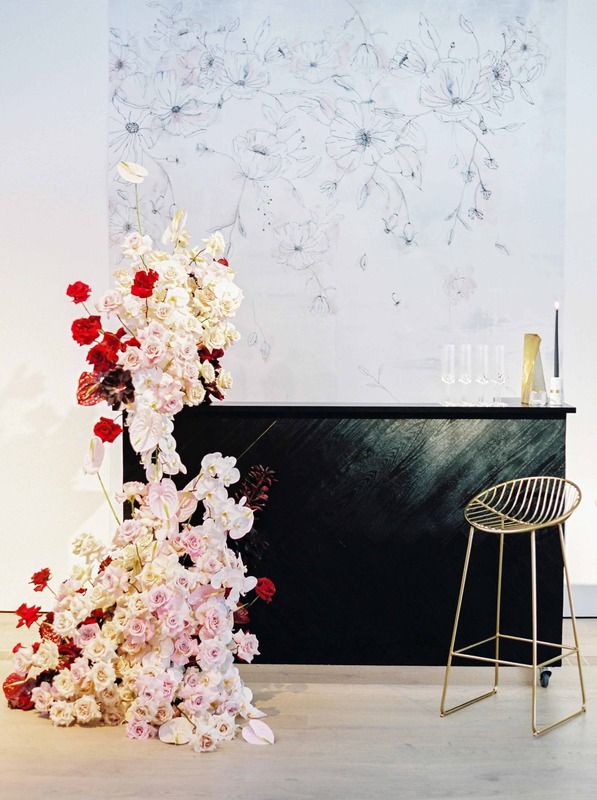 Emphasis is placed on the natural shapes and graceful lines of each flower, considering the form of the stems as well as the blooms. 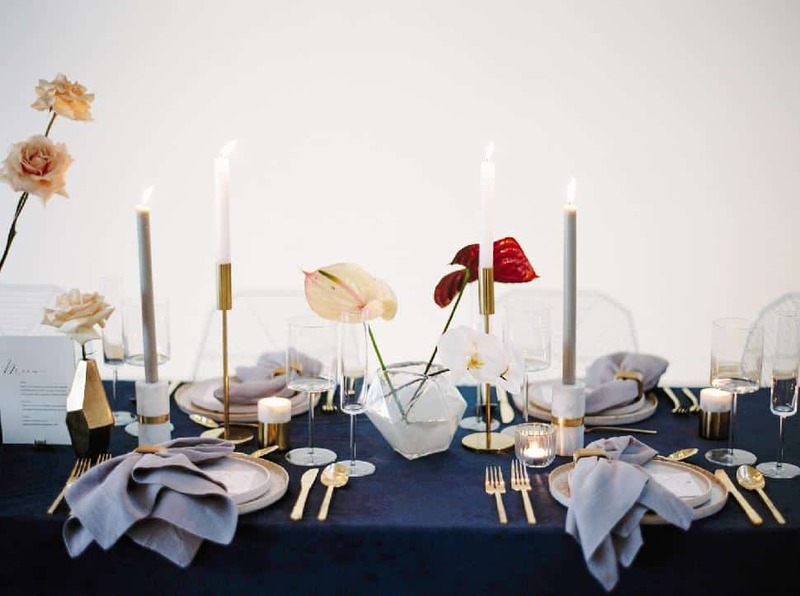 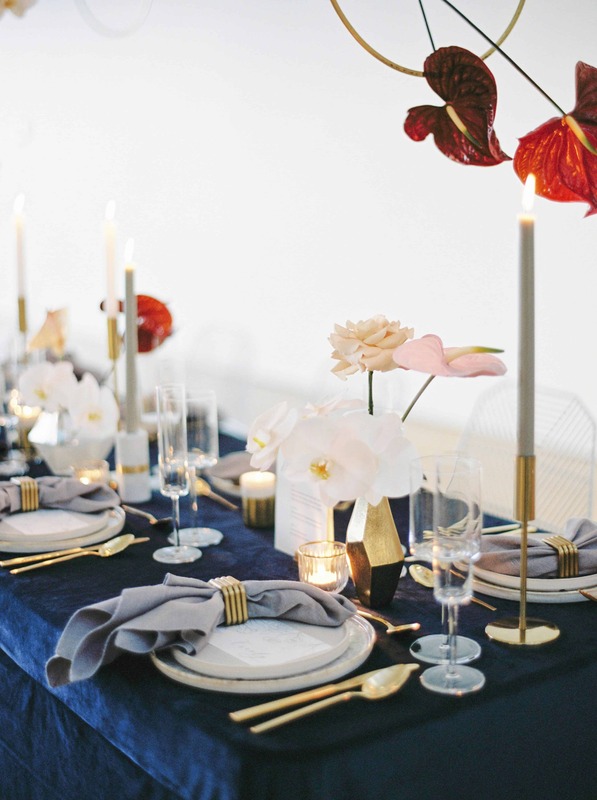 Heavy ceramic plates, mix-and-match vases and modern stemware from Pedersen’s Event Rentals are accented with gold to make the place settings shine. 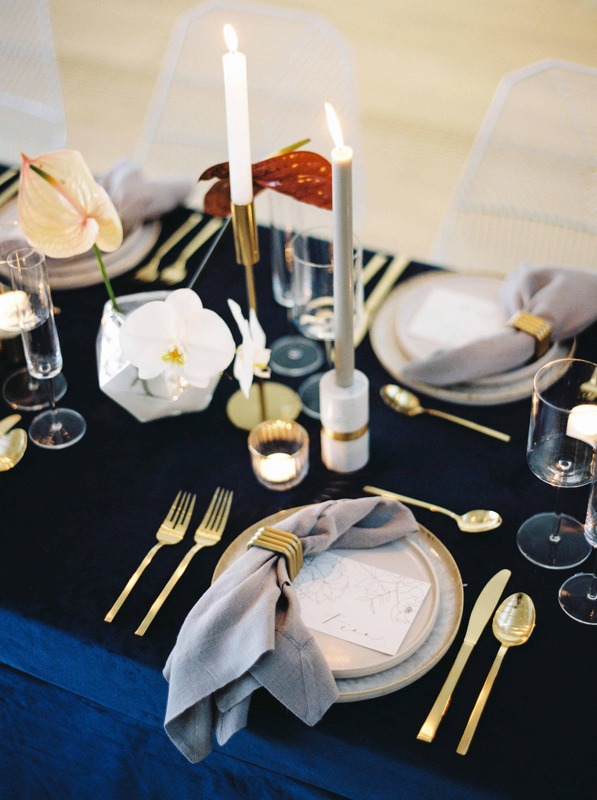 The combination of both grey and white candlesticks adds dimension. 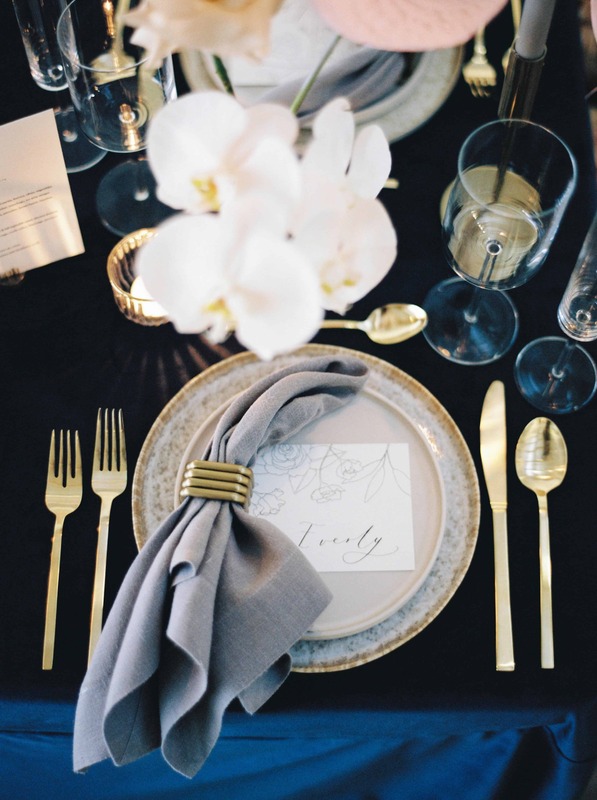 The hard lines of the gold napkin rings contrast beautifully against the dainty floral illustrations on the place cards.